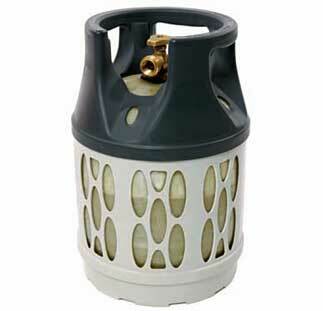 Propane is used by Airstreamers to fuel stoves, provide heat and even heat water. Carried on the front tongue of the trailer, well maintained propane tanks are a necessity for campers who want to be self contained and able to camp anywhere in comfort. Almost all Airstreamers use propane. The most common type of LP gas container is the propane cylinder, also known as a bottle or tank. 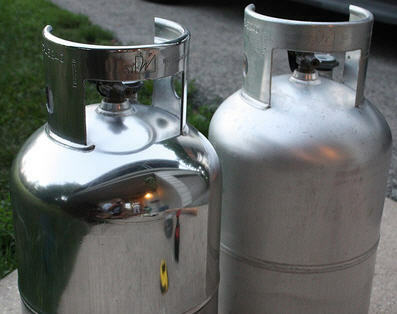 Propane tanks are usually made of steel, but can be found in aluminum and composite materials as well. 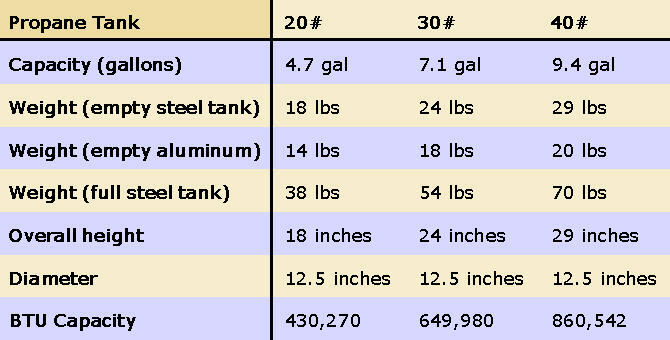 Most Airstream trailers have 2 propane tanks but the tank size varies depending on the model and vintage of the trailer. It’s possible to change the bottle size on your trailer but be mindful of additional weight when considering this possibility. 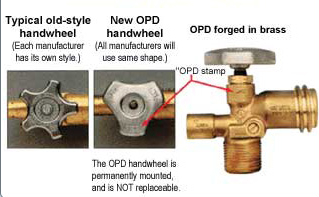 Propane cylinders under 40 pounds are required to be equipped with an OPD (Overfill Protection Device) Valve. Propane bottles equipped with OPD valves have a triangular hand wheel at the top of the valve itself. OPD valves have been required for bottles used in the US since 2002 and more recently in Canada. Old style valves are no longer permitted however you can have your tanks revalved to meet current requirements at many commercial propane dealers. This is especially worth doing if you own expensive aluminum tanks. Cylinders need to be recertified within twelve years of their manufacture date and every five years after that. Bottles also must have ledgible markings showing that they are intended for propane use. Protective collars, a foot ring and are also required and should be a reflective color. Almost all areas of North America require that a certified or trained technician fill your propane tanks but actual bottle filling policies and prices vary by station. Some charge to fill the cylinder but others may charge by the gallon. Charging by the cylinder is a fairly common and you need to understand that you may be charged for the cylinder volume even if your bottle isn't rally empty.. Many propane tanks are made of steel, and they are inclined to rust. This rust can cause pitting on the outside of the tank and make the tank useless. If you find rust on your tanks try cleaning with a wire brush and then repainting. Many Airstreamers prefer rust-free aluminum tanks. While substantially more expensive that their steel counterparts, these tanks are much lighter weight and match the classic aluminum exterior of Airstreams. Aluminum tanks when new have a flat finish but can be polished to a gloss with some elbow grease. Many airforums members have polished tanks to a high sheen. Here’s one in progress by airforums member bredlo.